Fountain Lighting The Scott Aerator De-Icer products are designed to keep large areas of water free from ice build-up, even under the most extreme North American weather conditions. Enjoy your water feature at night. Illuminate it with one of our high-quality, under-water lighting systems. Available in rugged halogen or LED light sets and colored lens set options are long-lasting, energy-efficient and designed for years of carefree enjoyment. Enjoy your Scott water feature at night! Illuminate it with one of our high-quality, under-water lighting systems. Our rugged halogen or LED light sets and colored lens set options are long-lasting, energy-efficient and designed for years of carefree enjoyment. 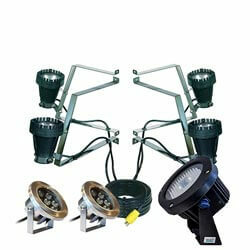 Kasco's LED Lighting is designed and engineered to be the most reliable fountain lighting on the market. Using a one-piece composite housing and a lens that's been ultrasonically welded and guaranteed to stay in place, you can trust Kasco's lighting to be leak-free and brilliantly lit for hours of enjoyment.